I love boiled peanuts, even though I grew up in New England, and a boiled peanut had never touched my lips until I was an adult. In fact the first boiled peanuts I ever had my good friend, Liz, made. She had frozen hers, which is equally as good as canning them. I became intrigued with canning them a few years ago, and have since made many jars for friends and family. My grandsons love them as a snack and can't seem to get enough of them. This process of cooking and canning or freezing the boiled peanuts is one of the best I've found. Of course you can add spices to the boiled peanuts, so I added some Old Bay Seasoning to a couple of jars and they were a huge hit! * Only use peanuts that are green (uncured). Not the color green, but fresh raw peanuts which are called green peanuts. The peanuts must not be roasted or already cooked or dried. 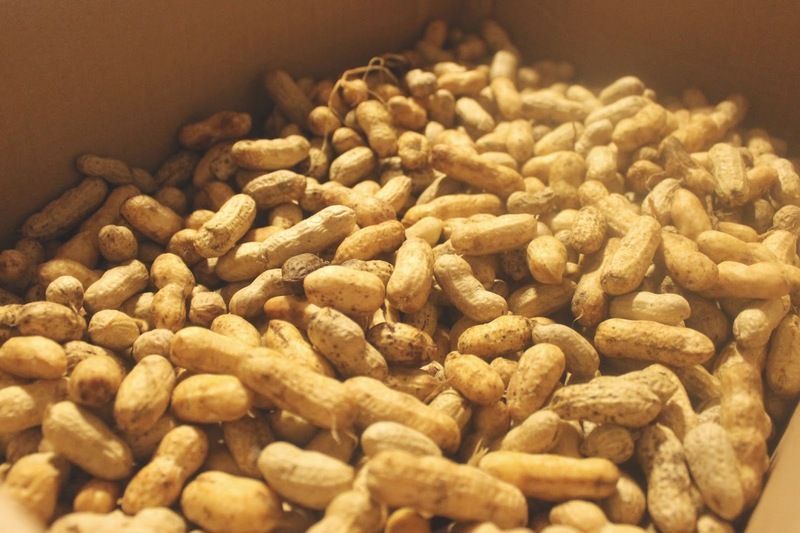 Wash un-shelled peanuts thoroughly in cold water until water runs clear (removing loose soil and sprouts, stems, weeds, and leaves); then soak in cool, clean water for approximately 30 minutes before cooking. In a large heavy pot, place soaked peanuts and cover completely with water. Stir to "settle" the peanuts. Add enough water to cover the peanuts by 2 inches or more. Add 1 cup of salt per gallon of water used. Other spices or seasonings (such as shrimp or crab boil, Cajun seasoning, chili powder, and other strong spices) may be added at this point, if desired. Bring water to a boil and then reduce the heat and let the peanuts simmer, covered, for approximately 4 hours (may take longer), stirring occasionally, and then taste. Add additional water as needed to keep the peanuts covered. Taste again in 10 minutes, both for salt and texture. Keep cooking and tasting until the peanuts reach desired texture (when fully cooked, the texture of the peanut should be similar to that of a cooked dry pea or bean). To check whether they are done, pull 1 or 2 peanuts out of the pot and crack them open. When they are soft, they are done. If they are still slightly crunchy, they are not done yet, If they are not salty enough, leave them in the salted water and turn off the heat. 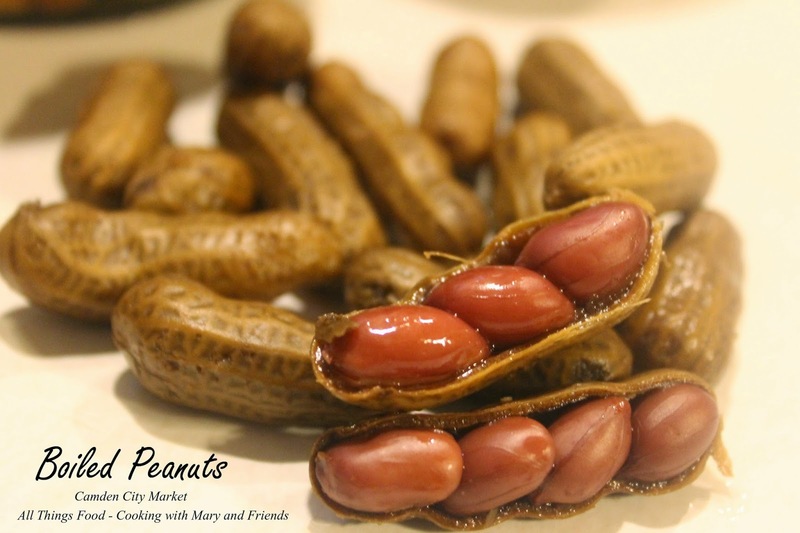 NOTE: The cooking time of boiled peanuts varies according to the maturity of the peanuts used and the variety of peanuts. The cooking time for a "freshly pulled" or green peanut is shorter than for a peanut that has been stored for a time. Remove from heat and drain peanuts after cooking or they will absorb salt and become over salted. Peanuts may be eaten hot or at room temperature, or chilled in the refrigerator and eaten cold, shelling as you eat them. The peanuts may be stored in a covered container in the refrigerator for up to one (1) week. Freezing boiled peanuts: Prepare peanuts as indicated above. Drain, allow to cool, and freeze in airtight containers. They keep indefinitely. 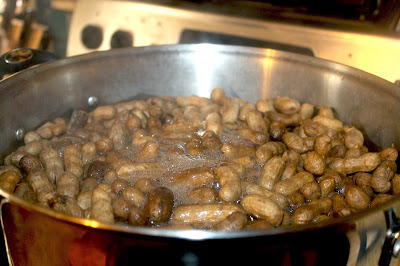 Canning Boiled Peanuts: Cook peanuts in salted water as stated above until they are soft and salty to your preference. Drain peanuts from cooking brine and rinse several times with fresh water (I use my sink). 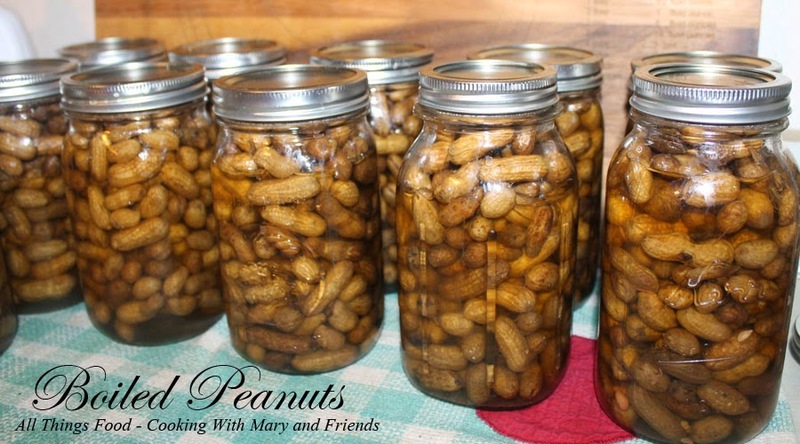 Pack peanuts into sterilized jars to within one-half inch of the top. Add fresh hot water leaving 1/2-inch head-space. Add 2 tsps. salt per quart jar. Seal while hot and process in a Pressure Canner 45 minutes at 10 pounds pressure. Remove canner from heat, allow it to come down from the pressure until lid unlocks, partially remove lid and let jars cool slowly in the canner for 20 minutes (this will prevent the liquid from siphoning out). Remove lid completely, then remove jars and let cool undisturbed 24 hours on your kitchen counter-top. Store in cool, dry place such as a dark pantry. Shelf life is one year.